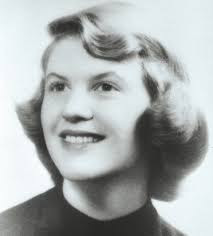 Sylvia Plath is an American poet whose troubled life and powerful works remain a source of controversy. Here are five interesting facts that beautifully spotlights on some important issues in her life. 1. The first time Sylvia Plath met Ted Hughes, she was so excited that she bit him on the face. The two felt an inexplicable attraction to one another and almost immediately began biting each other’s faces off – literally. When they left the party at which they had met, Plath noticed that blood was running down Hughes’ face. 2. Ted Hughes and Sylvia Plath married on 16th June – because of James Joyce. Plath and Hughes chose this day for their nuptials in honour of Bloomsday, the day on which the action of James Joyce’s 1922 novel Ulysses takes place. But Joyce himself chose 16th June because, among other things, it was the day on which, in 1904, he had his first proper date with Nora Barnacle, the woman who later became his wife. We’ve discussed this, and other Joycean and Ulyssean moments, in these two posts, on Ulysses and on Joyce’s life. 3. Plath’s father was an expert on bees. An entomologist, and Professor of Biology at Boston University, Otto Plath wrote a monograph on bumblebees called Bumblebees and Their Ways, published in 1934 when Sylvia was two years old. 4. Sylvia Plath committed suicide in an apartment in which W. B. Yeats had once lived. Plath knew that 23 Fitzroy Road, London, the flat she rented from 1962 until her death in 1963, had once been rented by the great Irish poet; she reportedly considered this a good omen for her own writing. However, it would be in the Fitzroy Road apartment that she would take her own life, just over a year later. 5. Plath wrote a book of nonsense poems for children. Called The Bed Book, the volume comprised a series of poems about different kinds of beds. This was only published posthumously, in 1976. As with most classic children’s books, The Bed Book was written for the amusement of the author’s own children. The original British edition was illustrated by Quentin Blake, best known for providing the distinctive illustrations to many of Roald Dahl’s books for children. Salman Rushdie and his "Midnight's Children"
Summary of E. V. Lucas' Essay "The Town Week"